March 21, 2013 – Cooper-Young is gearing up for the Arts for Arts Sake Auction (http://artauction.cooperyoung.org/) April 13. This year, the auction’s theme is green because proceeds are going towards the installation of solar panels on the Trestle, so the decision regarding this year’s featured artist seems to be a reasonable fit. “We are pleased to announce that the featured artist for 2013 is Karen ‘Bottle’ Capps,” the auction website exclaims. Capps is known for creating artwork by recycling scraps she finds in various places ranging from estate sales to the Mississippi River. Many in the neighborhood may recognize the elaborate bottle artwork in the front yard of her home of nearly twenty years, but her yard art is only the tip of the iceberg. One of Capps’ many specialties is making collage portraits of buildings. On the wall in her dining area above a motley chest of drawers hangs one of the first collage pieces she has created. Capps made the piece with what was then the William Len Building in mind. Capps lived there in the ‘80s. As her career as an artist began to blossom, Karen “Bottle” Capps ventured into the idea of using her skills to create house portraits. “People are attached to their houses,” the artist says explaining why she chose to create houses in her pieces. To make her house portraits more special for the client, Capps asks that they participate in the creating process by providing her with some of their own scraps. “I have people save their junk for me,” says Capps, but junk is not all she asks them for. Capps even recalls clients becoming emotional when presented with the finished product of their house portrait. However, she doesn’t take all of the credit for such reactions. “It takes the participant to make it special,” she says. 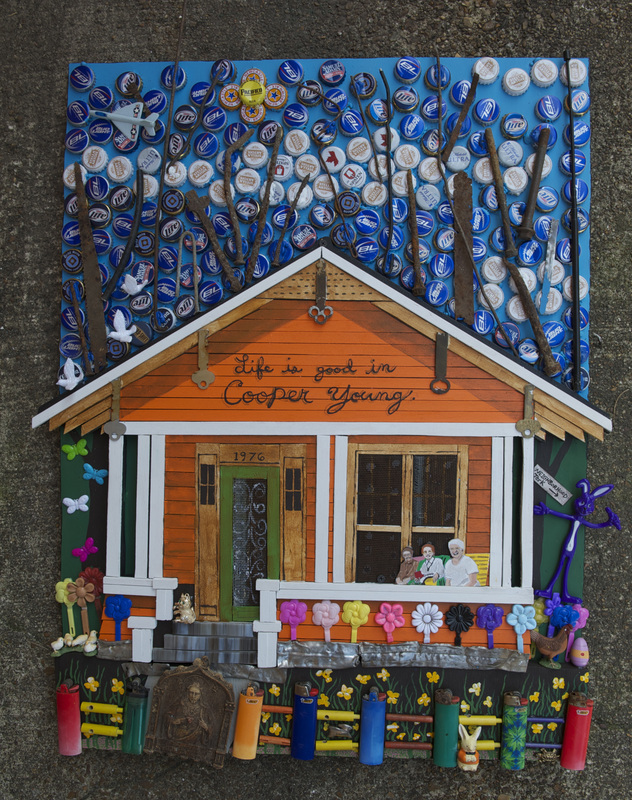 Capps has incorporated into her collages things ranging from trinkets that once belonged to one client’s deceased grandmother to baby teeth that another client had saved. Now, as the featured artist of the upcoming Arts for Art’s Sake Auction, Karen “Bottle” Capps has decided to create a portrait that is much closer to home. “I actually made a portrait of my own house. I’ve wanted to for a while,” she says. Among other things, Capps incorporated old keys, lighters, and, of course, bottle caps into her house portrait. The folk artist has also decided to make this piece a tribute to three “neighborhood icons,” as she considers them, one of whom is Betty Slack, who passed away three days before the art auction last year. The Arts for Art’s Sake Auction takes place April 13 at Young Avenue Deli from 6 p.m. to 9 p.m. Admission is $20 dollars for the public, and $15 for Cooper-Young Community Association members. View more of Karen “Bottle” Capps’ work and find out about upcoming events on her website. To find out about the origins of Junk Art, visit All About Junk Art.